The lively 4-stroke receives wit the excellent DOHC engine distiguished mainly by significantly more torque than its predecessor. The power plant, the optminzed frame and the new bodywork make the 250 XCF-W a champion's bike. BODYWORK The bodywork has been designed to achieve complete harmony between rider and bike, down to the finest details. 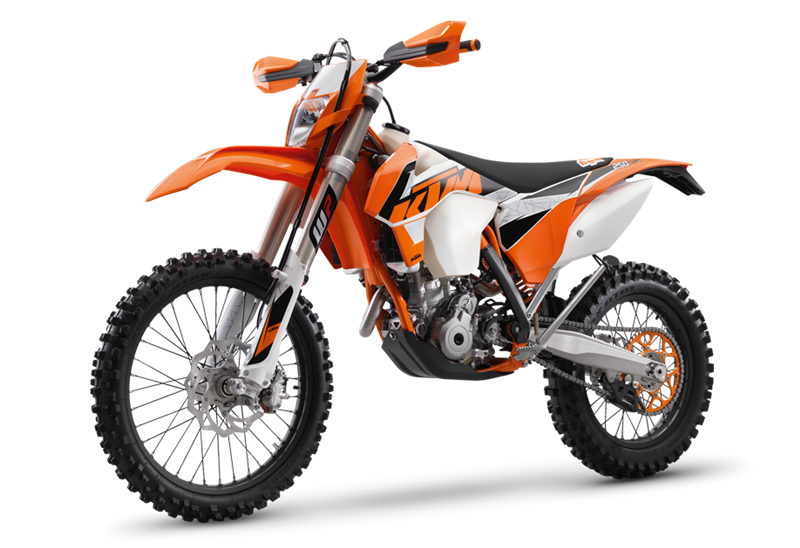 SUSPENSION/DAMPING The KTM 250 XCF-W is fitted with a new front fork featuring newly designed fork boots with shorter offset, increased trail and a new suspension settings, optimally tuned to weight and engine. In addition, the fork features new fork guards allowing for easier cleaning. At the rear, a PDS shock absorber from WP Suspension works with a direct linkage to the upper side of the swingarm. A wide range of setting options for rebound damping and high- and low-speed compression damping are standard and can be adjusted to suit racing and trail conditions. EXHAUST SYSTEM Light and robust. The aluminum silencers on XC-W models are renowned for their outstanding performance, while keeping noise to a level well within FIM rules. FRAME The modern frame design of the 250 XCF-W, comprising lightweight, high strength, chrome-molybdenum steel section tubes, combines maximum longitudinal stiffness with optimum torsional stiffness. This guarantees easy handling and precise steering behavior, as well as excellent ride stability. It clearly represents the benchmark in terms of weight and stability. Thanks to the frame design and the rear PDS damping system, impacts at the rear wheel are absorbed and dissipated optimally. For 2016 the frame is protected by a new, robust skidplate. CRANK-CASE The pressure the cast crankcase has been designed with significantly reduced wall thicknesses compared to cases produced by gravity die cast. The aluminum alloy utilized has great tensile strength while ensuring high resilience against stone-chipping and other damage. CYLINDER HEAD The centerpiece of the DOHC engine is its cylinder head with two overhead camshafts and DLC coated followers. The large, flow optimized ports in combination with large intake valves ensure a high flow rate, which in turn provides significant performance. The camshafts have been designed to achieve maximum power and torque figures while maintaining an off-road specific power delivery. STARTER The 250 XCF-W engine can be started with a kick starter as well as an electric starter. Well protected behind the cylinder, the electric starter is connected to the starter freewheel on the ignition rotor via the starter drive in the ignition cover. TRANSMISSION Specifically developed for the 250 XCF-W, the 6-speed off-road gearbox has relatively short gears from 1st to 5thand an overdrive 6th gear. The transmission is distinguished by easy and precise shifting. 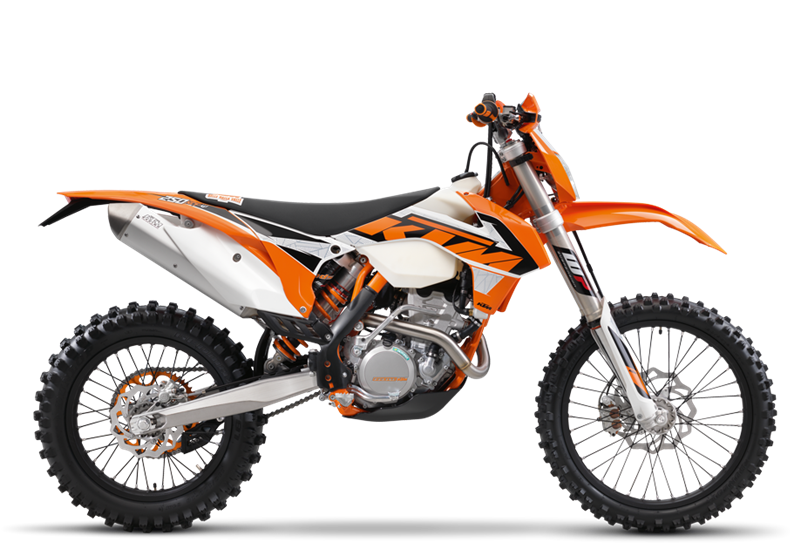 CRANKSHAFT The 250 XCF-W's crankshaft has a flywheel that is designed to achieve optimum traction. The crankshaft employs a plain big end bearing. Two force-fitted bearing shells run directly on the crank pin. The necessary oil feed for this bearing is ensured by the engine's pressure lubrication. This design increases the engine's long-term durability and lengthens crankshaft service intervals, which is a customer benefit in terms of time, effort and cost. CYLINDER & PISTON The short stroke and large bore allow the use of large valves. The lightweight, forged bridged box-type piston guarantees optimum performance and a dynamic power delivery, while the low oscillating mass reduces vibration. VALVE TRAIN The crankshaft drives an intermediate multifunctional shaft, which in turn drives the coolant pump and the two camshafts via the cam chain, while also acting as a counter balancer. A hydraulic tensioner ensures reliable chain tension to achieve highly precise valve timings.